The first morning of demos here at DEMO has begun, and the second product unveiling of the day looks potentially cool: A company called Plastic Logic previewed an e-book reader that uses electronic paper technology similar to that of the Amazon Kindle and Sony Reader–but in a larger, thinner form factor with a full touchscreen. 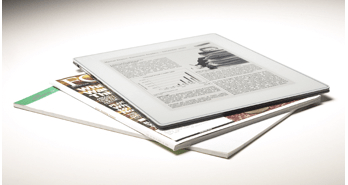 Plastic Logic says that unlike the Kindle and Sony, its product is aimed at folks reading business documents and magazines (the demo involved a copy of The Economist). The reader includes markup and annotation features that leverage the touchscreen, and the 8.5″-by-11″ screen size obviously makes sense both in terms of providing more real estate and mimicking the typical size of business documents printed on plain old paper. I have and enjoy using a Kindle, but I’m still something of an electronic paper skeptic: The displays are monochrome, with gray text on a gray background, and there’s not enough grayscale to do decent photos. (I remain baffled by hype for electronic paper that touts it as looking like real paper or being wonderfully legible.) And while the Plastic Logic reader has some advantages over a notebook–it’s a third the weight of a MacBook Air and the electronic paper technology lets it run for days on one battery charge–I’m curious whether the business types that the company wants to cater to will buy and carry both a notebook and an electronic reader. So far, I’ve only seen the Plastic reader from my seat in DEMO’s demo hall; I’m looking forward to seeing it up close. The company didn’t mention a price or a shipping date–actually, even the product name is TBD. This is getting close to what I’m waiting on. I imagine a day when I get a subscription to a newspaper, they send me this paper-thin hardware. It contains a power source (maybe solar) and wi-fi. In the end it would be the paper, with all the links, images, ads, etc. But it can be updated on the fly (like their website is) and is highly portable, much like a newspaper is today. They applied for a trademark for “Thinair” and “Thinaire”, but I don’t think the USPTO will approve either — too conflicted. They are probably just waiting for a ruling.